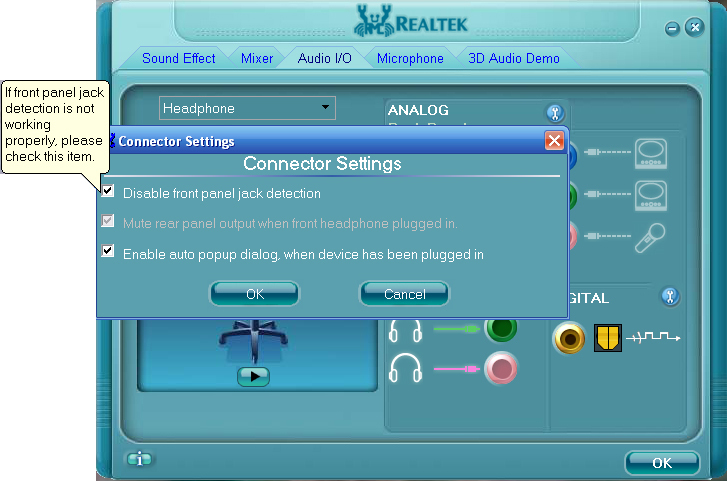 If you use the Realtek audio configuration software and the front audio ports aren't working on your computer, this will likely solve the issue. My problem was that no sound came out of anything I plugged into the front speaker, no sound was recorded from them, they would work for extremely brief periods of time, and they weren't being recognized as being plugged in on the audio configuration utility (normally, they light up when they're plugged in). 3. Click the small wrench next to "ANALOG"
4. 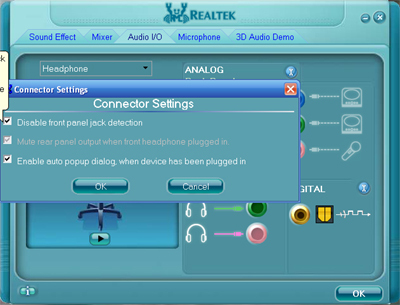 Select "Disable front panel jack detection"
I know it sounds weird to disable the detection, that's what I thought. After doing that, try a few different settings, such as speaker/headphone for the jack you think or know you have your speaker or microphone plugged in to, make sure the front ports are turned all the way up in the mixer and not muted... Make sure your normal audio controller (the one standard with windows) doesn't have anything muted. I searched on and off getting frustrated for around 6 months to find this simple bit of information. I hope this has helped you solve your problem! Thank you very much, this worked as you said! You're quite welcome! I'm happy I could help! "Disable fpj detection" = "enable fpj". Recently again I spent more hours to no avail. Thank you for reminding, should've kept a note at the first place. No problem, Forgetful. It took me quite a while to figure out the problem at first then just as long to figure out the solution since I couldn't find Realtek's documentation on front ports not working. I did what you typed and when I clicked the wrench, the only option that came up in the screen was "Enable auto popup dialog, when device has been plugged in"
it does not work 4 me. Hosted by HostNine This page was created in 0.0043351650238 seconds.